I stand by my comment that this is XKCD #927 all over – for me, ORCID is just another place that I need to keep my profile up to date, and it’s not even a very good one. It’s not the standard, it is just one of many competing standards for presenting my academic life to the world (in addition to those below (PURE; Google Scholar; ResearchFish; EndNote), there is Scopus, My NCBI, LinkedIn, ResearchGate, Mendeley, Microsoft, etc etc etc – the list is almost endless. 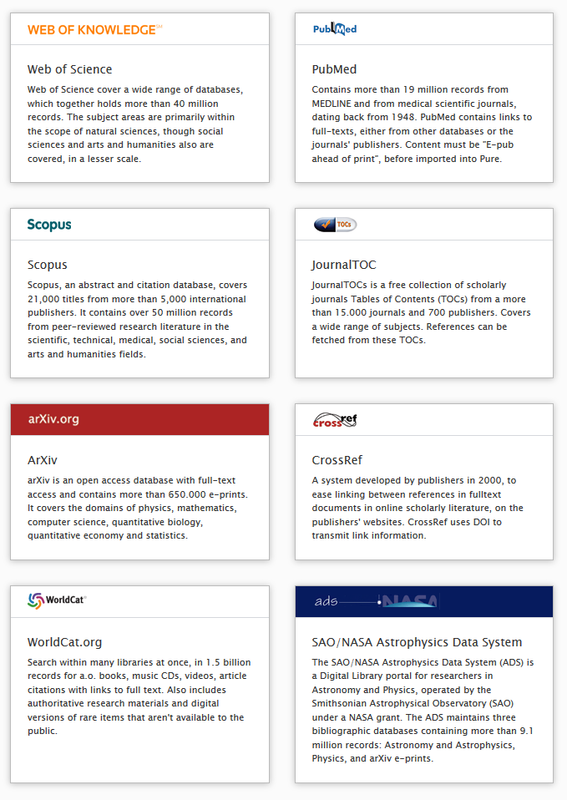 And yes I know you think ORCID will put an end to that list, but all of the other systems think the same thing, and that’s the point of that XKCD comic! OK firstly PURE is brilliant. Those of you who know me, I am not being sarcastic; you know how infrequently I compliment anything. But I am happy to compliment PURE. It is amazing, it does everything I need it to, and it does it really well. I have used both PURE and ORCID and let me tell you – PURE makes ORCID look like a 5yr old’s summer project. They are not even comparable, so I don’t know why I am trying. Whilst PURE is a Ferrari, ORCID is a push-bike with only one wheel and the chain is broken. PURE is a research information management system sold by Elsevier, and it is the system chosen by my employer, the University of Edinburgh. Because I work for them, the University is perfectly within their rights to expect me to keep my PURE record up to date, and I do so with pleasure. PURE models perfectly the University, Schools, Organisational units within schools, projects and research outputs. Crucially, these all have many-to-many relationships, which means that I can assign any research output to any number of projects, organisational units and/or shcools. Also, projects and funding are kept separate (but related) – recognising that it is possible to have projects that do not relate to a particular grant, or which relate to many grants. I can add press clippings, I can add generic activities, I can add datasets, awards, public engagement activities, book chapters, patents, conference proceedings, my thesis, and all sorts of other things, and I can link them and relate them to my projects, my funding and my school – seamlessly, online and easily. As you can see, amongst others, this means I can import from PubMed, Scopus, Web of Science, CrossRef and ArXiv. I can import anything with a DOI. I can import anything with a pubmed ID. When I import those records, PURE parses them seemlessly into authors, title, journal, abstract etc etc and all I need do is link the record to the relevant project, funding and school and I am done. It works amazingly well and it takes no time at all. When it comes to reporting time, PURE has the concept of report definitions and I can slice and dice my data anyway I see fit, by school, project, funding, date etc all through an amazingly intuitive interface. I can then download the results in a number of formats; or I can simply choose to export all of my (or my project’s; or my school’s; or my funding’s…) publications as RIS (RefMan) or BibTex format. Finally, the whole system has an API, which means it drives the Edinburgh Genomics publication list, it drives my Roslin publication list, and it drives Edinburgh Research Explorer. I hate ResearchFish. Those of you who have been following my Twitter feed closely will remember! However, ResearchFish is the chosen platform through which the vast majority of my funders want me to report the outcomes of the grants they give me. Yep, the people who’ve given me millions of pounds of research and capital grants over the last few years want me to report my outputs in ResearchFish. So of course I am going to. The quick amonst you will point out that ResearchFish can import from ORCID; well, it’s stalemate I’m afraid, because we (as in Edinburgh) export our PURE records directly to ResearchFish, and this is carried out by others, meaning there is zero effort from me. It just happens. Of course, I need to edit the information once in there to make sure it is correct – but doubtless I would need to do the same if I went via ORCID. Like many academics, I have a Google Scholar profile, and whilst I dislike that it is not an open platform, I do like that it (generously) tracks citations, and I like that it seamlessly, almost magically, almost spookily, finds every single one of my publications a few days after it comes out, and asks politely if I would like to add it to my profile. It is almost never wrong, but it sometimes is, so Google Scholar demands a bit of attention to keep it up to date. Because I have always done it, I maintain an EndNote library with all of my papers (with PDFs) on network attached storage where I work. It’s pretty easy to maintain, again with simple imports from PubMed and other locations. So where does this leave ORCID? In the wilderness I’m afraid. At the moment, in my head it’s in the same place as ResearchGate, LinkedIn and other places – just another site where I need to remember my log in details, and try in vain to keep my records up to date. I’d rather not. I have a public profile of all of my grants, projects and research outputs in Edinburgh Research Explorer, driven by PURE. Sure, if ORCID becomes a place my employer recognises and starts to use, or which my funders begin to use for reporting – then ORCID becomes a solution rather than a problem. However, it is not there yet, and just because you really want it to be the standard for sharing academic profiles, it doesn’t mean that it is. Good luck to ORCID – it would be truly immense if all institutions around the world, including employers and funders, adopted a single system to store academic relationships. However, the chances of that happening are virtually zero, because institutions and funders want their data just so and may want to store private data alongside the public stuff. There needs to be significant improvements in the features of ORCID too – better import systems, easier interfaces for keeping data up to date, and an API so that we can drive websites off the data therein. If anyone from ORCID (or ResearchFish) wants me advice, then I’d tell them to take a look at PURE – it is near perfect. Of course, with time and effort, perhaps ORCID could becomes as good as PURE – but then, why not just use PURE?